If you had any doubt that airline fees aren’t extremely lucrative for the airlines, this should erase it: US Airways projects to bring in between $400 and $500 million this year from “ancillary revenue,” which is comprised of fees and other charges not directly related to a passenger’s airfare. 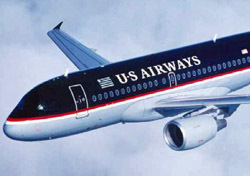 The estimate represents a huge jump from US Airways’ $165 million in ancillary revenue in 2008. Fees, while extremely unpopular at first, seem to have been accepted by the flying public. That’s the perception at US Airways, anyway. According to President Scott Kirby, there’s been “very little consumer pushback” to the new fees, even the beverage fee, which was rolled back in February largely because no other airlines matched it. All this may lead US Airways to post a profit this year, despite a sharp drop in demand and strong downward economic pressure. So, sorry, but all the pushback in the world wouldn’t matter—those fees and the $500 million that comes with them aren’t going anywhere.